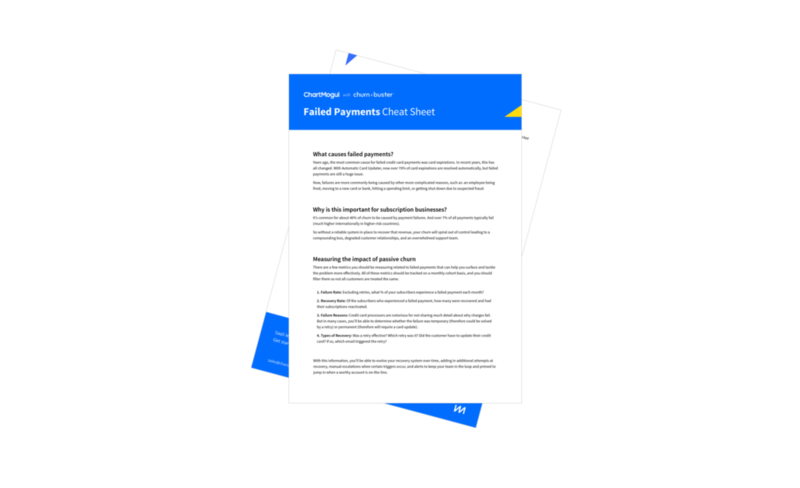 Do you know how much of your churn is due to failed payments? Our newest PDF guide unpacks how you can identify and address passive churn. Take a peek! Our content program aims to create, curate, and make available resources that make it easier to grow a subscription business. With this mission top of mind, we recently collaborated with our partner Churn Buster to publish a brand-new SaaS cheat sheet on the impact passive churn and what to do about failed payments (TL;DR — take me to the PDF goods). Many SaaS and subscription businesses grapple with how to develop the right mechanisms in order retain customers and revenue. Churn has lasting impacts beyond annual cash flow – it can affect customer relationships, the performance of your customer success team, and conversations with employees and investors. If you’re fighting churn, how do you determine where to start? As a first step, we typically recommend taking the time to understand what is driving your churn. There are likely different kinds of churn that impact your business and a one-size-fits-all approach in the era of personalization will leave you feeling frustrated. It’s common for about 40% of churn to be caused by payment failures—so why not start there? Our Failed Payment Cheat Sheet address what you should know about passive churn, its impact, and helpful best practices that will help you offset the negative effects of loss. How should you measure the impact of passive churn? How can you reduce passive churn? If you find this resource useful (and we hope you do! ), we’d love for you to share on Twitter or other social networks using the link below. Enjoy! If you’re growing a SaaS or subscription business, chartmogul.com/resources offers more easy reads, downloadables, and podcast episodes. We pride ourselves in simplifying the most complex metrics and business terms, and serving them up in an easy-to-consume, smartly-designed way. Go and take a look in our resource library!